Drawn and Quarterly, 9781770462090, 128pp. Included on Best of 2015 lists from Washington Post and Publishers Weekly! A New York Times bestseller! 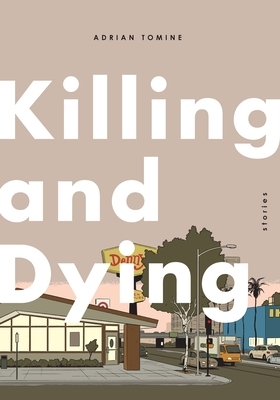 Killing and Dying is a stunning showcase of the possibilities of the graphic novel medium and a wry exploration of loss, creative ambition, identity, and family dynamics. With this work, Adrian Tomine (Shortcomings, Scenes from an Impending Marriage) reaffirms his place not only as one of the most significant creators of contemporary comics but as one of the great voices of modern American literature. His gift for capturing emotion and intellect resonates here: the weight of love and its absence, the pride and disappointment of family, the anxiety and hopefulness of being alive in the twenty-first century. "Amber Sweet" shows the disastrous impact of mistaken identity in a hyper-connected world; "A Brief History of the Art Form Known as Hortisculpture" details the invention and destruction of a vital new art form in short comic strips; "Translated, from the Japanese" is a lush, full-color display of storytelling through still images; the title story, "Killing and Dying", centers on parenthood, mortality, and stand-up comedy. In six interconnected, darkly funny stories, Tomine forms a quietly moving portrait of contemporary life. Tomine is a master of the small gesture, equally deft at signaling emotion via a subtle change of expression or writ large across landscapes illustrated in full color. Killing and Dying is a fraught, realist masterpiece.